ABC NEWS Terror Group Gets 'A' Rating From Better Business Bureau? 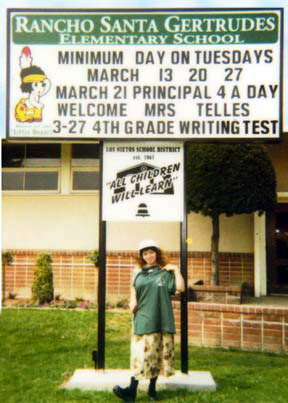 November 8, 2007, is Guiness World Record Day, and Carmen Tellez of CharmandHappy.com in Pico Rivera, CA flew to Cincinnati, Ohio to participate among 60 of Steve Jones' closest friends and associates from around the world are celebrating the day by attempting to create the world's largest balloon sculpture! 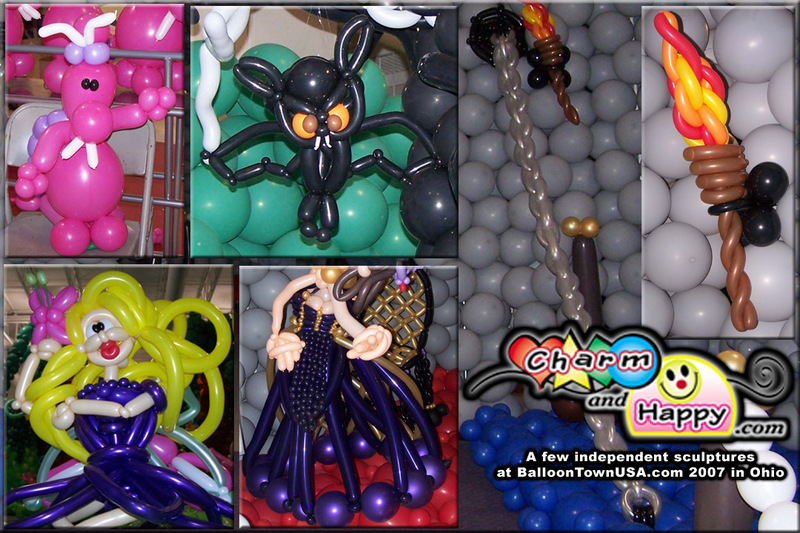 Steven Jones of Aeration Decorations, based in Cincinnati, leads an international team of balloon designers with the 4th annual BalloonTown USA event. The event is at Cincinnati Mills Mall in the old Media Play building. Artists are attending from throughout the United States, Europe and Israel. Over 150,000 balloons will be used to break the existing record set in 2003 by an Italian team of balloon designers. Their sculpture used just over 59,000 balloons, so the Cincinnati effort should easily surpass the record. The event was open to the public. The event is also a charity fund raiser. Proceeds from the project will be donated to St. Rita School for the Deaf and the Down Syndrome Association of Greater Cincinnati. A press conference took place at BalloonTown USA on Thursday, November 8th at 10:00 AM. At that time, there was an official ribbon cutting ceremony and guided tour through the completed sculpture. 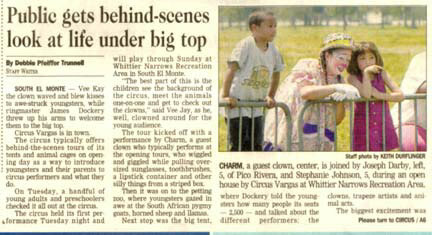 ..CIRCUS VARGAS Frontpage. Notice the young girl Stephanie in pink. She works at the circus. She has appeared on commercials, in movies in English and Spanish and in Circus Vargas promotional videos. Charm was honored to be educated about the circus by her. Read more of the SGVTribune. 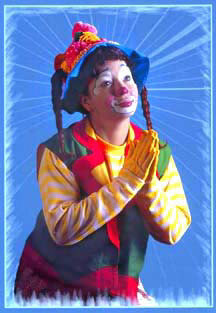 ..Charm believes that clowning is more than just putting on a costume and some big shoes to match a big nose. Clowning is heart felt way of life. Yet it is an extension of theatre art. Sure, anyone can easily buy a halloween costume and some greasy make-up to call themself a clown. Not just anyone can extend a true warmth of comedy. LA GALAXY Soccer Team in L.A. Times During their "Go For the Gold" season. ==Carmen is always upgrading her skills by participating in one course or another. 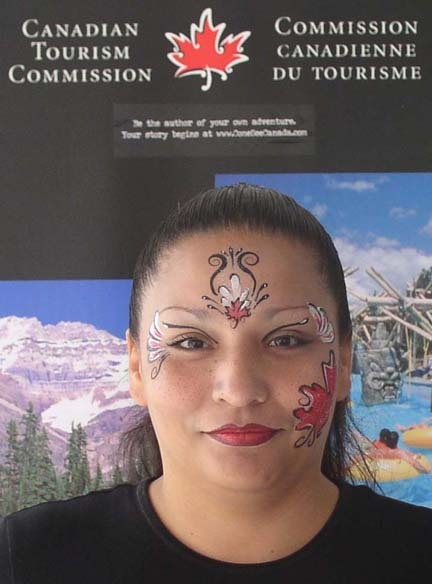 She enjoys meeting new entertainers and the professional experienced ones as well. Below are other workshops she attended. ..MOOSEBURGER Charm went to Mooseburger Clown Camp of Minnesota. 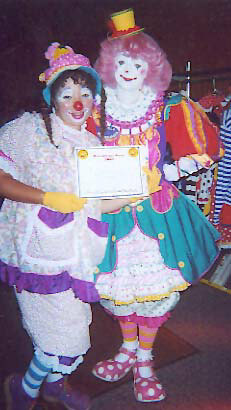 She took Frosty Little (Ringling Brothers Last Master Clown, now retired) Circus Clown Course. She participated in the stage movements, expressions, comedy delivery, timing needed in performing in the All Star Show for the public on August 1st. The show aird on NBC channel 4 and KTLA channell 11 and Minnesota news stations. ==In case you are wondering, Charm did not get a chance to visit the Mall of American (gosh). She was too busy learning circus routines for big stage shows. 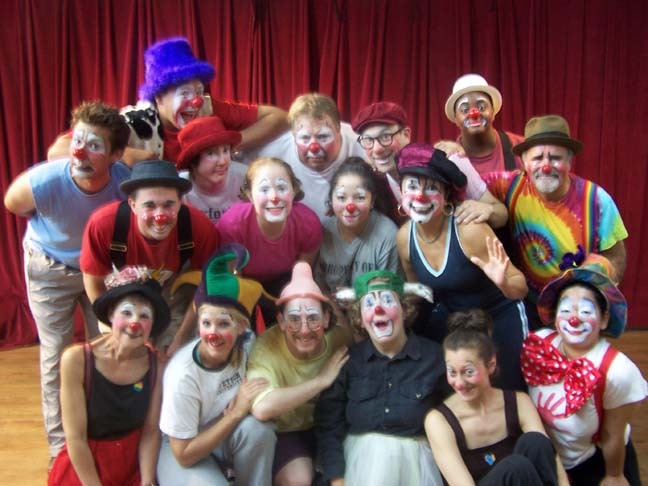 She also learned plenty of old stories from Frosty Little (Ringling Brothers last Master Clown alive) about circus travel, clown alley gags, media insights, dinner with the president and so on. ==Charm was very much interested in the juggling. Most of all, she made some long lasting friendships. ==Channel 7 of Minnesota aired a news clip on the performance Charm was cast in.